My experience of work in the area of Diet and ADHD now spans 35 years. First group closely followed – 75 families – reported in Australian Family Physician 1978. I also followed up diet use in self help groups, attending meetings and discussion groups for over 20 years, meeting or hearing from many families allowing collection of data on foods tolerated or not, and of symptoms that change with diet. I had the unique experience of being the only dietitian to have been employed specifically to practice seeing if there was any change with diet, and to ensure that nutrition was not jeopardized by diet use. The position was part time over 10 years in twelve clinics. Data was collected throughout the first five years in child mental health clinics in 500 families from 1984 to 1989 and reported in Aust J N D in1991. Further patients, around 500, were seen and followed up from ’90 to ’94. I also saw patients in Private Practice from 1984 to present – at least 500 with ADHD symptoms. My Review article was published in 1997 in J Paediatr Child Hlth so covers all research up until the mid 1990s. It includes the most important research references. Overall I have followed up over 2000 food sensitive families for my applied research findings, and seen many more in clinical practice over the thirty five years. I have also outlined diet management for dietitians who want to learn about the area. This manual is also available on line. 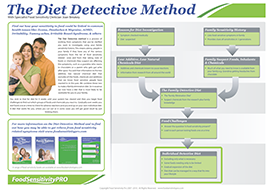 It provides the Diet Detective Method, which incorporated the element of scientific investigation. My work is complemented by the diet information provided by the RPAH Allergy Unit in Sydney but is more liberal based in clinical findings to suit management in families managing ADHD. I have provided an invited chapter in an international book – J Breakey, The Role of Food Additives and Chemicals in Behavioural, Learning, Activity, and Sleep Problems in Children, in Food Additives, 2nd Edn, 2000; AL Branen, PM Davidson, S Salminen, JH Thorngate, eds. Marcel Dekker, New York, Basel. It is a published source for the clinical findings in my thesis. Grand Round Presentation at RCH, Brisbane, Present knowledge on diet and behaviour, 2006.